My vision for a Klout web part was to have a control that served two purposes. The first purpose would be to allow users to enter their Klout account (if one wasn't entered already) which would then get stored in their profile. The second would be to actually display the Klout Score in the web part if the account was previously entered. 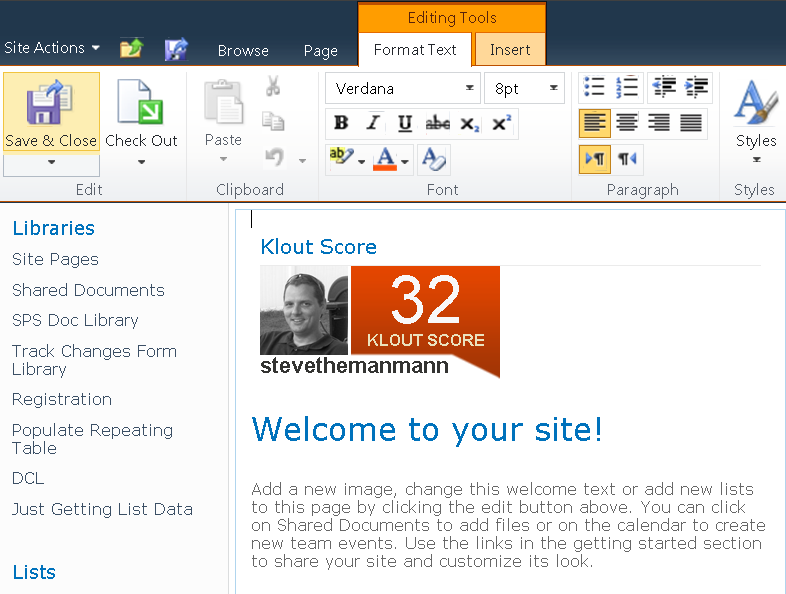 Create a control that has at least a text box and button for the user to enter their Klout account. Have the web part render the Klout Widget image if the user's profile contained a Klout account. I have a step-by-step walkthrough of these tasks in my guide here. The steps in the guide are based on SharePoint 2010, however, it is a similiar process for SharePoint 2007 and SharePoint Online (via Office 365). 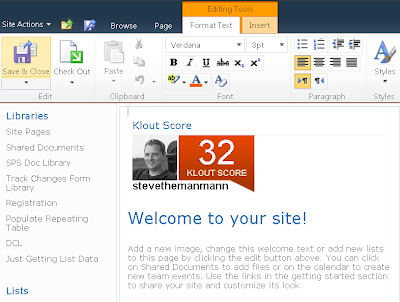 There are also instructions contained in the guide on how you may access and download code that assists in integrating Klout with SharePoint. If you found this useful, please help support my SharePoint and .NET user group (Philly SNUG) by clicking on the logo below. Steve Mann is a Microsoft Technology Expert and published author with over 20 years of professional experience in the area of software development. He is involved with analysis, design, and development of integrated business solutions and systems utilizing Microsoft technologies and platforms specializing in SharePoint Server.